WASHINGTON, Feb. 4, 2011 /PRNewswire-USNewswire/ — NASA will score big on super SUN-day at 11 a.m. EST, Sunday, Feb. 6, with the release online of the first complete view of the sun’s entire surface and atmosphere. Seeing the whole sun front and back simultaneously will enable significant advances in space weather forecasting for Earth, and improve planning for future robotic or crewed spacecraft missions throughout the solar system. 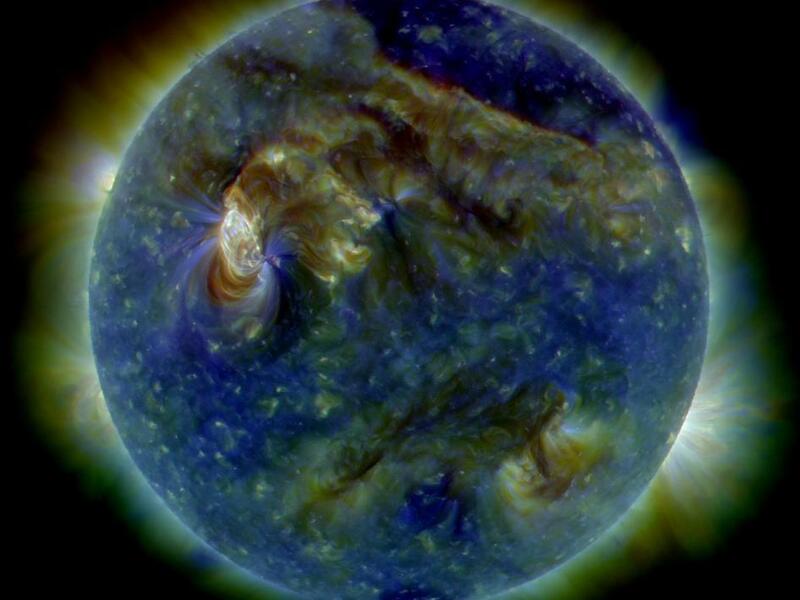 These views are the result of observations by NASA’s two Solar TErrestrial Relations Observatory (STEREO) spacecraft. The duo are on diametrically opposite sides of the sun, 180 degrees apart. One is ahead of Earth in its orbit, the other trailing behind. Launched in October 2006, STEREO traces the flow of energy and matter from the sun to Earth. It also provides unique and revolutionary views of the sun-Earth system. The mission observed the sun in 3-D for the first time in 2007. In 2009, the twin spacecraft revealed the 3-D structure of coronal mass ejections which are violent eruptions of matter from the sun that can disrupt communications, navigation, satellites and power grids on Earth. STEREO is the third mission in NASA’s Solar Terrestrial Probes program within the agency’s Science Mission Directorate in Washington. NASA’s Goddard Space Flight Center in Greenbelt, Md., manages the mission, instruments and science center. The Johns Hopkins University Applied Physics Laboratory in Laurel, Md., designed and built the spacecraft and is responsible for mission operations. The STEREO imaging and particle detecting instruments were designed and built by scientific institutions in the U.S., UK, France, Germany, Belgium, Netherlands and Switzerland. GREENBELT, Md., Sept. 16 /PRNewswire-USNewswire/ — The moon was bombarded by two distinct populations of asteroids or comets in its youth, and its surface is more complex than previously thought, according to new results from NASA’s Lunar Reconnaissance Orbiter (LRO) spacecraft featured in three papers appearing in the Sept. 17 issue of Science. Meteorite impacts can radically alter the history of a planet. The moon, Mars, and Mercury all bear scars of ancient craters hundreds or even thousands of miles across. If Earth was subjected to this assault as well — and there’s no reason to assume our planet was spared — these enormous impacts could have disrupted the initial origin of life. Large impacts that occurred later appear to have altered life’s evolution. The approximately 110-mile-diameter, partially buried crater at Chicxulub, in the Yucatan Peninsula of Mexico, is from an impact about 65 million years ago that is now widely believed to have led or contributed to the demise of the dinosaurs and many other life forms. Scientists trying to reconstruct the meteorite bombardment history of Earth face difficulty because impact craters are eroded by wind and water, or destroyed by the action of plate tectonics, the gradual movement and recycling of the Earth’s crust. However, a rich record of craters is preserved on the moon, because it has only an extremely thin atmosphere — a vacuum better than those typically used for experiments in laboratories on Earth. The moon’s surface has no liquid water and no plate tectonics. The only source of significant erosion is other impacts. Even so, previous lunar maps had different resolutions, viewing angles, and lighting conditions, which made it hard to consistently identify and count craters. Head and his team used the LOLA instrument on board LRO to build a map that highlights lunar craters with unprecedented clarity. The instrument sends laser pulses to the lunar surface, measures the time that it takes for them to reflect back to the spacecraft, and then with a very precise knowledge of the orbit of the LRO spacecraft, scientists can convert this information to a detailed topographic map of the moon, according to Head. Objects hitting the moon can be categorized in different “impactor populations,” where each population has its own set of characteristics. Head also used the LOLA maps to determine the time when the impactor population changed. “Using the crater counts from the different impact basins and examining the populations making up the superposed craters, we can look back in time to discover when this transition in impactor populations occurred. The LRO LOLA impact crater database shows that the transition occurred about the time of the Orientale impact basin, about 3.8 billion years ago. The implication is that this change in populations occurred around the same time as the large impact basins stopped forming, and raises the question of whether or not these factors might be related. The answers to these questions have implications for the earliest history of all the planets in the inner solar system, including Earth,” says Head. In the other two Science papers, researchers describe how data from the Diviner Lunar Radiometer Experiment instrument on LRO are showing that the geologic processes that forged the lunar surface were complex as well. The data have revealed previously unseen compositional differences in the crustal highlands, and have confirmed the presence of anomalously silica-rich material in five distinct regions. Every mineral, and therefore every rock, absorbs and emits energy with a unique spectral signature that can be measured to reveal its identity and formation mechanisms. For the first time ever, LRO’s Diviner instrument is providing scientists with global, high-resolution infrared maps of the moon, which are enabling them to make a definitive identification of silicate minerals commonly found within its crust. “Diviner is literally viewing the moon in a whole new light,” says Benjamin Greenhagen of NASA’s Jet Propulsion Laboratory in Pasadena, Calif., lead author of one of the Diviner Science papers. Lunar geology can be roughly broken down into two categories – the anorthositic highlands, rich in calcium and aluminium, and the basaltic maria, which are abundant in iron and magnesium. Both of these crustal rocks are what’s deemed by geologists as ‘primitive’; that is, they are the direct result of crystallization from lunar mantle material, the partially molten layer beneath the crust. Diviner’s observations have confirmed that most lunar terrains have spectral signatures consistent with compositions that fall into these two broad categories. However they have also revealed that the lunar highlands may be less homogenous than previously thought. In a wide range of terrains, Diviner revealed the presence of lunar soils with compositions more sodium rich than that of the typical anorthosite crust. The widespread nature of these soils reveals that there may have been variations in the chemistry and cooling rate of the magma ocean which formed the early lunar crust, or they could be the result of secondary processing of the early lunar crust. Most impressively, in several locations around the moon, Diviner has detected the presence of highly silicic minerals such as quartz, potassium-rich, and sodium-rich feldspar — minerals that are only ever found in association with highly evolved lithologies (rocks that have undergone extensive magmatic processing). The detection of silicic minerals at these locations is a significant finding for scientists, as they occur in areas previously shown to exhibit anomalously high abundances of the element thorium, another proxy for highly evolved lithologies. One thing not apparent in the data is evidence for pristine lunar mantle material, which previous studies have suggested may be exposed at some places on the lunar surface. Such material, rich in iron and magnesium, would be readily detected by Diviner. However, even in the South Pole Aitken Basin (SPA), the largest, oldest, and deepest impact crater on the moon — deep enough to have penetrated through the crust and into the mantle — there is no evidence of mantle material. The implications of this are as yet unknown. Perhaps there are no such exposures of mantle material, or maybe they occur in areas too small for Diviner to detect. However, it’s likely that if the impact that formed this crater did excavate any mantle material, it has since been mixed with crustal material from later impacts inside and outside SPA. “The new Diviner data will help in selecting the appropriate landing sites for potential future robotic missions to return samples from SPA. We want to use these samples to date the SPA-forming impact and potentially study the lunar mantle, so it’s important to use Diviner data to identify areas with minimal mixing,” says Greenhagen. The research was funded by NASA’s Exploration Systems Missions Directorate at NASA Headquarters in Washington. LRO was built and is managed by NASA’s Goddard Space Flight Center in Greenbelt, Md. LOLA was built by NASA Goddard. David E. Smith from the Massachusetts Institute of Technology and NASA Goddard is the LOLA principal investigator. The Diviner instrument was built and is managed by NASA’s Jet Propulsion Laboratory in Pasadena, Calif. UCLA is the home institution of Diviner’s principal investigator, David Paige. And announcing the first five solar missions. No need to rush and book reservations, though, since this mission is a good eight years from launch. News hot from today’s inbox. WASHINGTON, Sept. 2 /PRNewswire-USNewswire/ — NASA has begun development of a mission to visit and study the sun closer than ever before. The unprecedented project, named Solar Probe Plus, is slated to launch no later than 2018. The small car-sized spacecraft will plunge directly into the sun’s atmosphere approximately four million miles from our star’s surface. It will explore a region no other spacecraft ever has encountered. NASA has selected five science investigations that will unlock the sun’s biggest mysteries. As the spacecraft approaches the sun, its revolutionary carbon-composite heat shield must withstand temperatures exceeding 2550 degrees Fahrenheit and blasts of intense radiation. The spacecraft will have an up close and personal view of the sun enabling scientists to better understand, characterize and forecast the radiation environment for future space explorers. NASA invited researchers in 2009 to submit science proposals. Thirteen were reviewed by a panel of NASA and outside scientists. The total dollar amount for the five selected investigations is approximately $180 million for preliminary analysis, design, development and tests. — Solar Wind Electrons Alphas and Protons Investigation: principal investigator, Justin C. Kasper, Smithsonian Astrophysical Observatory in Cambridge, Mass. This investigation will specifically count the most abundant particles in the solar wind — electrons, protons and helium ions — and measure their properties. The investigation also is designed to catch some of the particles in a special cup for direct analysis. — Wide-field Imager: principal investigator, Russell Howard, Naval Research Laboratory in Washington. This telescope will make 3-D images of the sun’s corona, or atmosphere. The experiment actually will see the solar wind and provide 3-D images of clouds and shocks as they approach and pass the spacecraft. This investigation complements instruments on the spacecraft providing direct measurements by imaging the plasma the other instruments sample. — Fields Experiment: principal investigator, Stuart Bale, University of California Space Sciences Laboratory in Berkeley, Calif. This investigation will make direct measurements of electric and magnetic fields, radio emissions, and shock waves that course through the sun’s atmospheric plasma. The experiment also serves as a giant dust detector, registering voltage signatures when specks of space dust hit the spacecraft’s antenna. — Integrated Science Investigation of the Sun: principal investigator, David McComas of the Southwest Research Institute in San Antonio. This investigation consists of two instruments that will take an inventory of elements in the sun’s atmosphere using a mass spectrometer to weigh and sort ions in the vicinity of the spacecraft. — Heliospheric Origins with Solar Probe Plus: principal investigator, Marco Velli of NASA’s Jet Propulsion Laboratory in Pasadena, Calif. Velli is the mission’s observatory scientist, responsible for serving as a senior scientist on the science working group. He will provide an independent assessment of scientific performance and act as a community advocate for the mission. The Solar Probe Plus mission is part of NASA’s Living with a Star Program. The program is designed to understand aspects of the sun and Earth’s space environment that affect life and society. The program is managed by NASA’S Goddard Space Flight Center in Greenbelt, Md., with oversight from NASA’s Science Mission Directorate’s Heliophysics Division. The Johns Hopkins University Applied Physics Laboratory in Laurel, Md., is the prime contractor for the spacecraft. Well, really this one isn’t very beautiful at all aesthetically, but as a human achievement it is utterly amazing. This is the first image of the Earth taken from the moon’s distance by United States Lunar Orbiter I on this day (August 23) in 1966. By using technology developed for Mars missions. The budget for NASA gets debated, scoffed at and cut, but all too often people against giving NASA money forget how many products and processes developed for space travel ended up with solidly terrestrial applications. IMAGE: Researchers have developed technology for large-scale solar power installations to self-clean. BOSTON, Aug. 22, 2010 — Find dusting those tables and dressers a chore or a bore? Dread washing the windows? Imagine keeping dust and grime off objects spread out over an area of 25 to 50 football fields. That’s the problem facing companies that deploy large-scale solar power installations, and scientists today presented the development of one solution — self-dusting solar panels ― based on technology developed for space missions to Mars. In a report at the 240th National Meeting of the American Chemical Society (ACS), they described how a self-cleaning coating on the surface of solar cells could increase the efficiency of producing electricity from sunlight and reduce maintenance costs for large-scale solar installations. Mazumder, who is with Boston University, said the need for that technology is growing with the popularity of solar energy. Use of solar, or photovoltaic, panels increased by 50 percent from 2003 to 2008, and forecasts suggest a growth rate of at least 25 percent annually into the future. Fostering the growth, he said, is emphasis on alternative energy sources and society-wide concerns about sustainability (using resources today in ways that do not jeopardize the ability of future generations to meet their needs). Large-scale solar installations already exist in the United States, Spain, Germany, the Middle East, Australia, and India. These installations usually are located in sun-drenched desert areas where dry weather and winds sweep dust into the air and deposit it onto the surface of solar panel. Just like grime on a household window, that dust reduces the amount of light that can enter the business part of the solar panel, decreasing the amount of electricity produced. Clean water tends to be scarce in these areas, making it expensive to clean the solar panels. The self-cleaning technology involves deposition of a transparent, electrically sensitive material deposited on glass or a transparent plastic sheet covering the panels. Sensors monitor dust levels on the surface of the panel and energize the material when dust concentration reaches a critical level. The electric charge sends a dust-repelling wave cascading over the surface of the material, lifting away the dust and transporting it off of the screen’s edges. Mazumder said that within two minutes, the process removes about 90 percent of the dust deposited on a solar panel and requires only a small amount of the electricity generated by the panel for cleaning operations. Well, thirty years and a day since I didn’t post this yesterday. Thrust from a Titan 3/Centaur rocket launched NASA’s Viking 1 spacecraft on a 505-million-mile journey to Mars on Aug. 20, 1975. 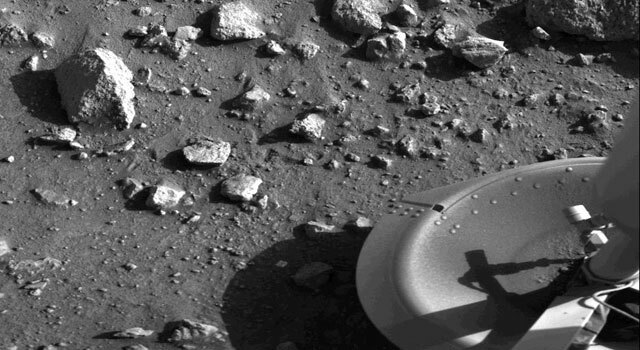 Viking 2 followed three weeks later. This is the first photograph ever taken on the surface of the planet Mars. 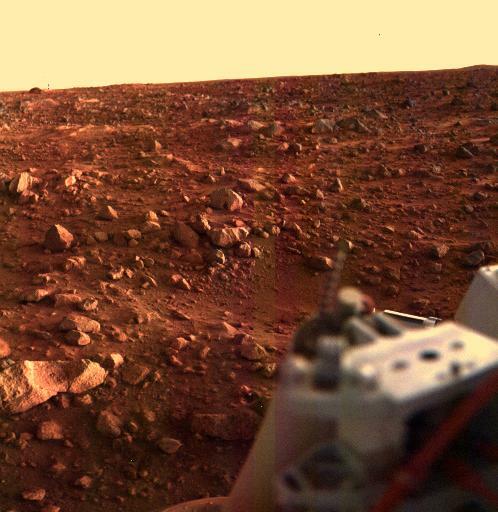 It was obtained by Viking 1 just minutes after the spacecraft landed successfully. 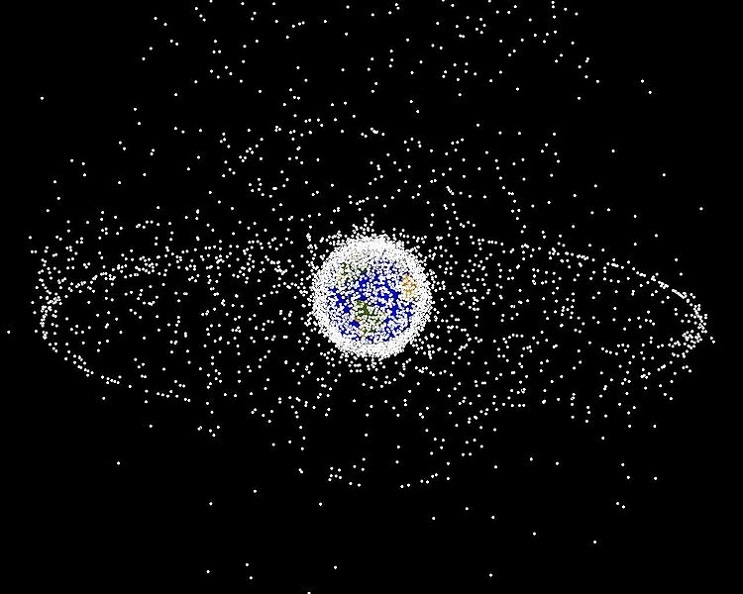 You have to admit, it’s a pretty cool idea for cleaning up low Earth orbit. A dozen space vehicles, equipped with 200 nets each, could scoop up the space debris floating in low Earth orbit, clearing the way for a future space elevator. That’s the idea described last Friday at the annual Space Elevator conference by Star Inc., a company that is receiving funding for the project from DARPA. Looks like the International Space Station crew will have to undertake a third spacewalk to attempt to repair the faulty cooling system. Best of luck to current batch of space travelers, this is a challenging issue. Despite making one of the longest spacewalks ever, Douglas Wheelock and Tracy Caldwell Dyson had to give up trying to remove a broken ammonia pump and retreat inside. Disappointed managers said two more spacewalks now will be needed to replace the pump and get the International Space Station’s cooling system operating normally again. The original plan called for two spacewalks. 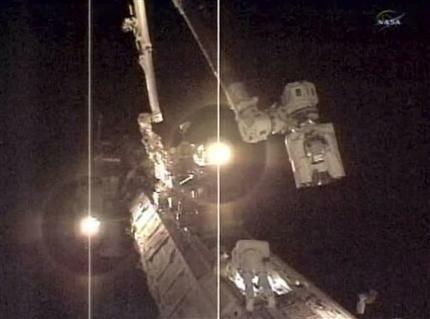 Another spacewalk won’t be attempted until Wednesday at the earliest. Engineers huddled following Saturday’s eight-hour, three-minute effort – the sixth longest spacewalk ever – to consider their options. The pump failure knocked out half of the space station’s cooling system last weekend, leaving the orbiting lab with only one good cooling loop. Another breakdown could leave the station in a precarious situation. A space image two-fer today! The X-ray image from Chandra shows huge clouds of hot, interstellar gas that have been injected with rich deposits of elements from supernova explosions. This enriched gas, which includes elements such as oxygen, iron, magnesium and silicon, will be incorporated into new generations of stars and planets. The bright, point-like sources in the image are produced by material falling onto black holes and neutron stars that are remnants of the massive stars. Some of these black holes may have masses that are almost one hundred times that of the Sun. The Spitzer data show infrared light from warm dust clouds that have been heated by newborn stars, with the brightest clouds lying in the overlap region between the two galaxies. The Hubble data reveal old stars in red, filaments of dust in brown and star-forming regions in yellow and white. Many of the fainter objects in the optical image are clusters containing thousands of stars. I’ve done a little blogging on CubeSats and here’s the latest news from NASA. WASHINGTON — NASA has announced a second opportunity for small satellite payloads to fly on rockets planned to launch in 2011 and 2012. These CubeSats could be auxiliary cargo on previously planned missions. CubeSats are a class of research spacecraft called nanosatellites. The cube-shaped satellites are approximately four inches long, have a volume of about one quart and weigh less than 2.2 pounds. CubeSat investigations should be consistent with NASA’s Strategic Plan or the Education Strategic Coordination Framework. The research should address aspects of science, exploration, technology development, education or operations. Applicants must submit proposals electronically by 4:30 p.m. EST, Nov. 15. NASA will select the payloads by Jan. 31, 2011, but selection does not guarantee a launch opportunity. Collaborators may be required to provide partial reimbursement of approximately $30,000 per CubeSat. NASA will not provide funding for the development of the small satellites. NASA recently announced the results from the first round of the CubeSat Launch Initiative. Twelve payloads have made the short-list for launch opportunities in 2011 and 2012. They are eligible for launch pending an appropriate opportunity and final negotiations. The satellites come from 10 states: Alabama, Alaska, California, Colorado, Michigan, Montana, New Hampshire, New York, Utah and Vermont. A solar flare from August 1, 2010 no less (last Sunday). On August 1, 2010, almost the entire Earth-facing side of the sun erupted in a tumult of activity. 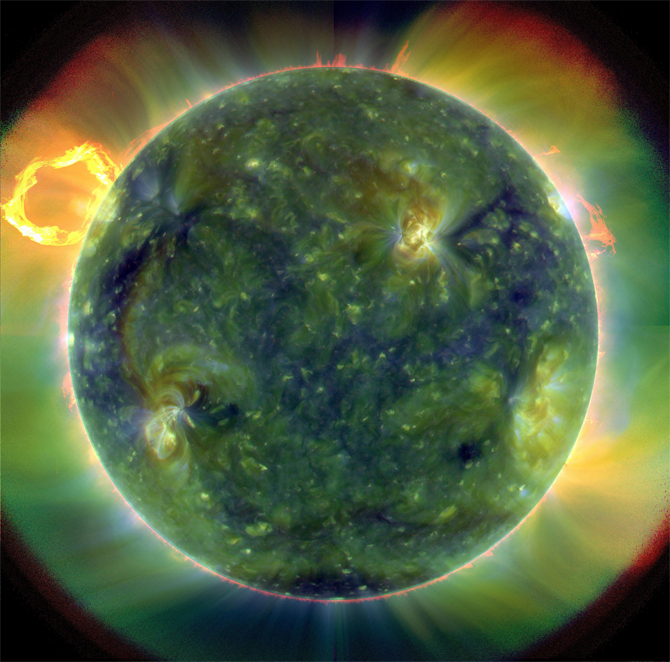 This image from the Solar Dynamics Observatory of the news-making solar event on August 1 shows the C3-class solar flare (white area on upper left), a solar tsunami (wave-like structure, upper right), multiple filaments of magnetism lifting off the stellar surface, large-scale shaking of the solar corona, radio bursts, a coronal mass ejection and more. This multi-wavelength extreme ultraviolet snapshot from the Solar Dynamics Observatory shows the sun’s northern hemisphere in mid-eruption. Different colors in the image represent different gas temperatures. Earth’s magnetic field is still reverberating from the solar flare impact on August 3, 2010, which sparked aurorae as far south as Wisconsin and Iowa in the United States. 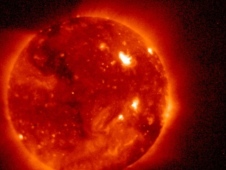 Analysts believe a second solar flare is following behind the first flare and could re-energize the fading geomagnetic storm and spark a new round of Northern Lights. Is it a planet? Is it a comet? I don’t know! WASHINGTON, July 15 /PRNewswire-USNewswire/ — Astronomers using NASA’s Hubble Space Telescope have confirmed the existence of a baked object that could be called a “cometary planet.” The gas giant planet, named HD 209458b, is orbiting so close to its star that its heated atmosphere is escaping into space. Observations taken with Hubble’s Cosmic Origins Spectrograph (COS) suggest powerful stellar winds are sweeping the cast-off atmospheric material behind the scorched planet and shaping it into a comet-like tail. The planet, located 153 light years from Earth, weighs slightly less than Jupiter but orbits 100 times closer to its star than the Jovian giant. The roasted planet zips around its star in a short 3.5 days. In contrast, our solar system’s fastest planet, Mercury, orbits the sun in 88 days. The extrasolar planet is one of the most intensely scrutinized, because it is the first of the few known alien worlds that can be seen passing in front of, or transiting, its star. Linsky and his team used COS to analyze the planet’s atmosphere during transiting events. During a transit, astronomers study the structure and chemical makeup of a planet’s atmosphere by sampling the starlight that passes through it. The dip in starlight because of the planet’s passage, excluding the atmosphere, is very small, only about 1.5 percent. When the atmosphere is added, the dip jumps to 8 percent, indicating a bloated atmosphere. COS detected the heavy elements carbon and silicon in the planet’s super-hot 2,000 degrees Fahrenheit atmosphere. This detection revealed the parent star is heating the entire atmosphere, dredging up the heavier elements and allowing them to escape the planet. Hubble’s newest spectrograph has the ability to probe a planet’s chemistry at ultraviolet wavelengths not accessible to ground-based telescopes. COS is proving to be an important instrument for probing the atmospheres of “hot Jupiters” like HD 209458b. Another Hubble instrument, the Space Telescope Imaging Spectrograph (STIS), observed the planet in 2003. The STIS data showed an active, evaporating atmosphere, and a comet-tail-like structure was suggested as a possibility. But STIS wasn’t able to obtain the spectroscopic detail necessary to show a tail, or an Earthward-moving component of the gas, during transits. The tail was detected for the first time because of the unique combination of very high ultraviolet sensitivity and good spectral resolution provided by COS. Although this extreme planet is being roasted by its star, it won’t be destroyed anytime soon. “It will take about a trillion years for the planet to evaporate,” Linsky said. The results appeared in the July 10 issue of The Astrophysical Journal. 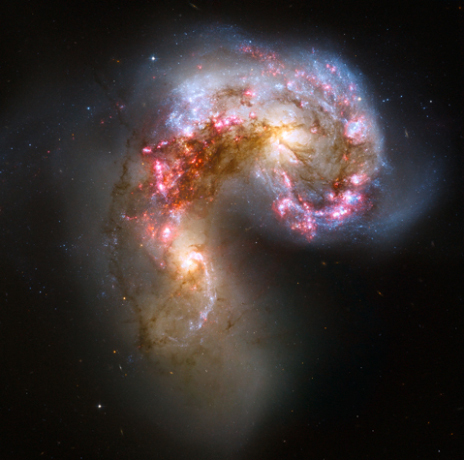 The Hubble Space Telescope is a project of international cooperation between NASA and the European Space Agency. NASA’s Goddard Space Flight Center in Greenbelt, Md., manages the telescope. The Space Telescope Science Institute, operated for NASA by the Association of Universities for Research in Astronomy, Inc. in Washington, conducts Hubble science operations. Caption: A colorful star-forming region is featured in this stunning new NASA/ESA Hubble Space Telescope image of NGC 2467. Looking like a roiling cauldron of some exotic cosmic brew, huge clouds of gas and dust are sprinkled with bright blue, hot young stars. Strangely shaped dust clouds, resembling spilled liquids, are silhouetted against a colourful background of glowing. Like the familiar Orion Nebula, NGC 2467 is a huge cloud of gas — mostly hydrogen — that serves as an incubator for new stars. This picture was created from images taken with the Wide Field Channel of the Advanced Camera for Surveys through three different filters (F550M, F660N and F658N, shown in blue, green and red). These filters were selected to let through different colours of red and yellow light arising from different elements in the gas. The total aggregate exposure time was about 2000 seconds and the field of view is about 3.5 arcminutes across. These data were taken in 2004. WASHINGTON, July 6 /PRNewswire-USNewswire/ — NASA has given gamers a taste of lunar adventure with release of Moonbase Alpha, an exciting new, free online video game. The game has single and multiplayer options that allow participants to step into the role of an exploration team member in a futuristic 3-D lunar settlement. Players must work to restore critical systems and oxygen flow after a meteor strike cripples a solar array and life support equipment. Available resources include an interactive command center, lunar rover, mobile robotic repair units and a fully-stocked equipment shed. The game is a proof of concept to show how NASA content can be combined with a cutting-edge game engine to inspire, engage and educate students about agency technologies, job opportunities and the future of space exploration. Moonbase Alpha is rated “E” for everyone. It is the first game in NASA’s Learning Technologies project. The project supports the delivery of NASA content through interactive technologies such as virtual worlds, games and software applications to enhance science, technology, engineering and mathematics, or STEM, education. Moonbase Alpha is a precursor to a planned NASA-based massively, multiplayer online game project. The project is being designed to have content and missions that require players to gain and demonstrate STEM knowledge to succeed. NASA released the game on Valve’s Steam network. The agency will use the Steamworks suite of services for server browsing, leaderboards, statistics and more. Steam has more than 25 million accounts and has released more than 1,100 games. It was built on Epic Games’ Unreal Engine 3. The Army Game Studio developed the game with support from Virtual Heroes, a division of Applied Research Associates in Research Triangle Park, N.C. This collaboration between NASA and the Army’s Aviation Missile Research Development and Engineering Center is an example of government agencies working together to improve education in the STEM fields. Robots on the moon in less than three years? Maybe so if you believe in the stated goals of NASA’s Project M.
Despite President Obama’s new budget proposal to scrap moon-landing plans NASA is pushing forward with a new lunar-based mission, dubbed Project M.
NASA made a big splash earlier this year when it unveiled a humanoid robot called Robonaut2 in partnership with GM. Via Kurzweil.net — This news a little daunting. NASA isn’t typically known for hyperbolic statements. OF course if we’re wiped out by “Planet X” in 2012 it’s a moot point anyway. In a new warning, NASA said a super storm in 2013 would hit like “a bolt of lightning” and could cause catastrophic consequences for the world’s health, emergency services, and national security unless precautions are taken. According to Dr. Richard Fisher, director of NASA‘s Heliophysics division, it could damage everything from the power grid, GPS navigation systems, major satellites, emergency services systems, hospital equipment, banking systems, and air traffic control devices, to everyday items such as home computers, and iPods. Hit this link for a much, much larger version (too big for this blog). GREENBELT, Md., June 14 /PRNewswire-USNewswire/ — The Solar X-Ray Imager instrument aboard the GOES-15 satellite has just provided its first light image of the sun, but it required a lot of experts to make it happen. Scientists and engineers from NASA and the National Oceanic and Atmospheric Administration (NOAA) have been working to bring the Solar X-Ray Imager (SXI) instrument to full functionality since the Geostationary Operational Environmental Satellite (GOES)-15, formerly known as the GOES-P satellite, achieved orbit. GOES-15 launched on March 4, 2010 from Cape Canaveral, Fla. On April 6, 2010, GOES-15 captured its first visible image of Earth and on April 26, GOES-15 took its first full-disk infrared image. On June 3, the GOES 15 Solar X-Ray Imager finally came on-line. Scientists and engineers had subjected SXI to a series of long duration turn on tests in the hopes of clearing the short. About 16 hours into the testing, the instrument voltages returned to normal values and SXI now appears to be functioning properly. Since its recovery, several test solar images have also been subsequently taken successfully. The GOES team continue to assess the health of the instrument. This new round of testing will assess SXI’s total functionality. That functionality means the team will capture images of the sun with the camera to assess whether the camera is properly processing image data. GOES-15 will join three other NOAA operational GOES spacecraft that help the agency’s forecasters track life-threatening weather and solar activity that can impact the satellite-based electronics and communications industry. NASA’s testing of the spacecraft and its instruments will continue through the entire post-launch test period expected to end in late August 2010. This will be followed by a series of NOAA Science Tests. The GOES series of U.S. satellites are developed by a joint NASA-NOAA-Industry partnership, launched by NASA (with industry partners), and operated by NOAA. To join today’s post on the next generation of Mars rovers, here is news hot from the inbox on a current Mars rover. PASADENA, Calif., June 3 /PRNewswire-USNewswire/ — Rocks examined by NASA’s Spirit Mars Rover hold evidence of a wet, non-acidic ancient environment that may have been favorable for life. Confirming this mineral clue took four years of analysis by several scientists. NASA’s rovers have found other evidence of formerly wet Martian environments. However the data for those environments indicate conditions that may have been acidic. In other cases, the conditions were definitely acidic, and therefore less favorable as habitats for life. Spirit inspected rock outcrops, including one scientists called Comanche, along the rover’s route from the top of Husband Hill to the vicinity of the Home Plate plateau which Spirit has studied since 2006. Magnesium iron carbonate makes up about one-fourth of the measured volume in Comanche. That is a tenfold higher concentration than any previously identified for carbonate in a Martian rock. Morris suspected iron-bearing carbonate at Comanche years ago from inspection of the rock with Spirit’s Moessbauer Spectrometer, which provides information about iron-containing minerals. Confirming evidence from other instruments emerged slowly. The instrument with the best capability for detecting carbonates, the Miniature Thermal Emission Spectrometer, had its mirror contaminated with dust earlier in 2005, during a wind event that also cleaned Spirit’s solar panels. Like this release hot from the inbox explains, the Phoenix Mars Lander exceeded its planned useful life by a gigantic margin. PASADENA, Calif., May 24 /PRNewswire-USNewswire/ — NASA’s Phoenix Mars Lander has ended operations after repeated attempts to contact the spacecraft were unsuccessful. A new image transmitted by NASA’s Mars Reconnaissance Orbiter (MRO) shows signs of severe ice damage to the lander’s solar panels. The MRO image of Phoenix taken this month by the High Resolution Imaging Science Experiment, or HiRISE, camera on board the spacecraft suggests the lander no longer casts shadows the way it did during its working lifetime. During its mission, Phoenix confirmed and examined patches of the widespread deposits of underground water ice detected by Odyssey and identified a mineral called calcium carbonate that suggested occasional presence of thawed water. The lander also found soil chemistry with significant implications for life and observed falling snow. The mission’s biggest surprise was the discovery of perchlorate, an oxidizing chemical on Earth that is food for some microbes and poisonous to other forms of life. The perchlorate results are shaping subsequent astrobiology research, as scientists investigate the implications of its antifreeze properties and potential use as an energy source by microbes. Discovery of the ice in the uppermost soil by Odyssey pointed the way for Phoenix. More recently, the MRO detected numerous ice deposits in middle latitudes at greater depth using radar and exposed on the surface by fresh impact craters. NASA’s MRO reached the planet in 2006 to begin a two-year primary science mission. Its data show Mars had diverse wet environments at many locations for differing durations during the planet’s history, and climate-change cycles persist into the present era. The mission has returned more planetary data than all other Mars missions combined. Odyssey has been orbiting Mars since 2001. The mission also has played important roles by supporting the twin Mars rovers Spirit and Opportunity. The Phoenix mission was led by Smith at the University of Arizona, with project management at JPL and development partnership at Lockheed Martin in Denver. The University of Arizona operates the HiRISE camera, which was built by Ball Aerospace and Technologies Corp., in Boulder. Mars missions are managed by JPL for NASA’s Mars Exploration Program at NASA Headquarters in Washington. As usual, hit the link up there for a larger version of the image and more information. 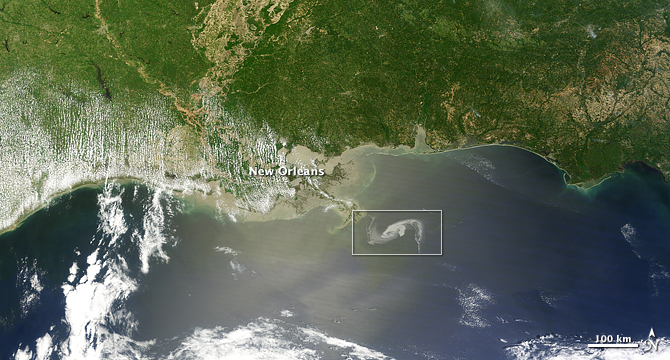 On April 29, the MODIS image on the Terra satellite captured a wide-view natural-color image of the oil slick (outlined in white) just off the Louisiana coast. The oil slick appears as dull gray interlocking comma shapes, one opaque and the other nearly transparent. Sunglint — the mirror-like reflection of the sun off the water — enhances the oil slick’s visibility. The northwestern tip of the oil slick almost touches the Mississippi Delta. Credit: NASA/Earth Observatory/Jesse Allen, using data provided courtesy of the University of Wisconsin’s Space Science and Engineering Center MODIS Direct Broadcast system. Be sure to hit the link for larger version of these satellite images and for more information. 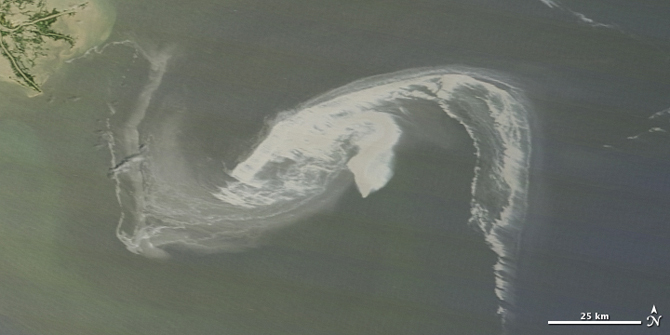 Caption: The MODIS instrument on NASA’s Terra satellite captured a visible image of the ash plume (brown) drifting south and east from Eyjafjallajökull volcano in Iceland at 11:55 UTC (7:55 a.m. EDT). For more information, here’s the full release accompanying this image. Hit the link for more information, a larger version of the image and additional posts with more images from the eruption. 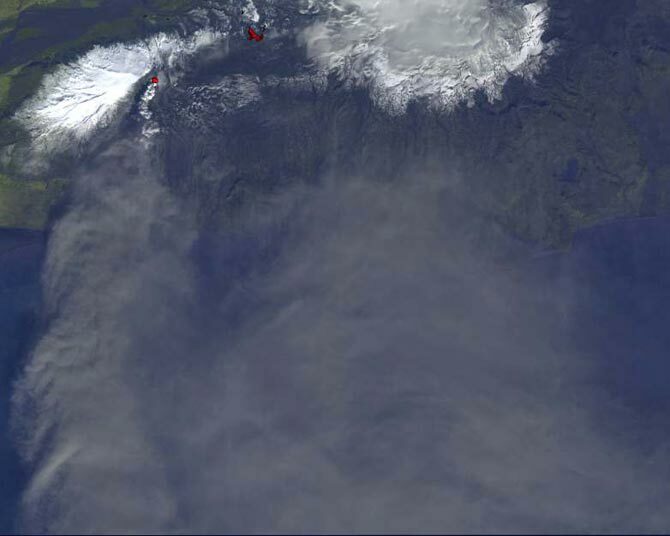 Caption: NASA’s Terra satellite flew over the volcano on April 16 10:45 UTC (6:45 a.m. EDT) and the MODIS instrument captured a visible image of Eyjafjallajökull’s ash plume (brown cloud) stretching from the UK (left) to Germany (right). Here’s a link to the release with more information on the image. Hubble has snapped a spectacular view of M 66, the largest “player” of the Leo Triplet, and a galaxy with an unusual anatomy: it displays asymmetric spiral arms and an apparently displaced core. The peculiar anatomy is most likely caused by the gravitational pull of the other two members of the trio. The unusual spiral galaxy, Messier 66, is located at a distance of about 35 million light-years in the constellation of Leo. Together with Messier 65 and NGC 3628, Messier 66 is the member of the Leo Triplet, a trio of interacting spiral galaxies, part of the larger Messier 66 group. Messier 66 wins in size over its fellow triplets — it is about 100 000 light-years across. Be sure to hit the link up there for an absolutely humongous version of the image. Here’s some additional background. A new infrared image from NASA’s Wide-field Infrared Survey Explorer, or WISE, shows a cosmic rosebud blossoming with new stars. The stars, called the Berkeley 59 cluster, are the blue dots to the right of the image center. They are ripening out of the dust cloud from which they formed, and at just a few million years old, are young on stellar time scales. 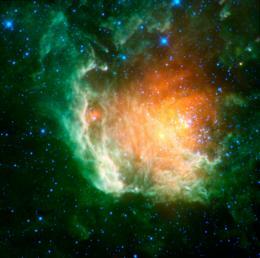 The rosebud-like red glow surrounding the hot, young stars is warm dust heated by the stars. Green “leafy” nebulosity enfolds the cluster, showing the edges of the dense, dusty cloud. This green material is from heated polycyclic aromatic hydrocarbons, molecules that can be found on Earth in barbecue pits, exhaust pipes and other places where combustion has occurred. Also hit the link for a much larger version of the image. I was going to run it here, but it’s a little too big for this blog’s format. Via KurzweilAI.net — Oh my, indeed. NASA‘s WISE mission has spotted 16 formerly hidden near-Earth objects with orbits close to Earth‘s. WISE is expected to discover as many as 1000 near-Earth objects, but astronomers estimate that the number of unknown objects with masses great enough to cause ground damage in an impact runs into the tens of thousands.